For the first time in a while, Supergirl put together an episode that centered around action, and the amazing things a woman with super-strength, flight and cold breath can accomplish. Still, it remained true to its CW incarnation, with a steady diet of family dynamics, make-out sessions and gay subtext involving Lena Luthor. The catalyst for this hour involves Cadmus putting its evil plan into action by rounding up all the aliens on the registry list, herding them onto a space freighter and shooting them on a one way trip to the other side of the galaxy. (We later learn this plan was a compromise worked out by Jeremiah Danvers, since Lillian Luther was content to just kill all of them). Chyler Leigh’s Alex carries much of the dramatic burden most of the episode. Much like Luke Skywalker in Return of the Jedi, Alex is convinced there is still good in her father, despite all evidence to the contrary. In her desperation to find Cadmus’ base and vindicate him, Alex severely beats a captive Cadmus agent in his cell, and fails a loyalty test cooked up by a shape changing Martian Manhunter. Kara isn’t faring much better in the career department. She figures it will be easy to get her boss, Snapper Carr, to allow her single-source story (and that source is herself in a cape), warning the alien population about Cadmus’ actions. Snapper goes on about corroborating sources, journalistic ethics, fake news and petty dictators in the White House before killing the story until Kara can, you know, do her job properly. Even a one-on-one interview with Supergirl isn’t enough to convince Snapper to compromise his standards. 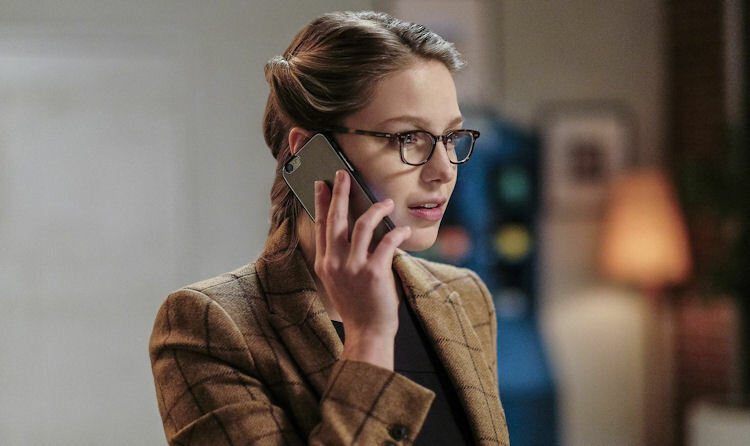 Lena (who just happened to be hanging out in the CatCo lobby) suggests if this story is so important, Kara go behind her employers’ back and publish the story on her own, via blog post. It’s a dilemma that Kara struggles with until Mon-El shows up offering potstickers, make-outs and continued questionable boyfriend behavior. She reluctantly publishes the story. (She also recuses Lea, who does her best Lois Lane impression, and falls off a balcony). Much like Arrow‘s gun control episode, Supergirl deserves a tip of the hat for making an effort to address what a mess the modern media landscape can be, despite spotty execution. Even if the headline of Kara’s story was “10 Things Cadmus is Doing to Aliens! You Won’t Believe No. 3!” it’s doubtful a writer with next to no internet presence and a handful of stories under her belt could get her story out so quickly. This is an alternate Earth, so maybe the rules of the Internet are different there. After failing her loyalty test, Alex officially gets kicked off the case, but of course that doesn’t stop her from continuing to find Cadmus’s base, with the help of Maggie (who like most characters in the CW superhero universe has stopped going to her job). Once there, she rigs the place to blow up, and proves she’s not screwing around by setting off some of the charges when Lillian tries to call her bluff. Alex also gets her vindication when Jeremiah reveals he’s tried to act as a moderating influence inside Cadmus (if you count forced deportation as moderate), pledges his love to his family and ultimately, helps Alex when the time comes. Because Lillian installed zero failsafe measures in the ship, Alex has to go onto it to stop its one-way course away from Earth. When she gets to the bridge, Alex realizes she’s got nothing, so it’s up to Supergirl to physically push the ship back down to the ground. It’s a big effects, high tension scene that works because it’s ultimately grounded in the relationship between Alex and Kara. It’s clear Kara is trying to save her sister — who is encourages her on the other side of the glass of the ship’s bridge — as much as she’s rescuing a ship full of innocent aliens. Once the day is saved, the Danvers sisters face very different consequences for their actions. Alex gets an apology and a return to active duty from J’honn, while Kara finds her stuff boxed up, and herself ,fired for insubordination relating to her blog post. Mon-El’s make-outs try to salve Kara’s wounded pride and broken dreams, but with the arrival of his parents (Terri Hatcher and Kevin Sorbo), even that might not work for long. After spending much of the season focusing on Supergirl‘s internal dramas, it was nice to see the series cut loose and go a little more wall-to-wall action. What’s more exciting is that it’s pulled it off in a way that the Gorilla City two-parter on The Flash could only dream about. Despite only being around two seasons and dealing with a network change, Supergirl has a better handle on its strengths and weaknesses than any of its sibling shows on The CW, and it shows in episodes like this where it is able to convincingly and seamlessly mix current events statements, family dynamics and high adventure together. Next story A Blind Item Reveals the Current Bond 25 Contenders, But Have Producers Forgotten Their Best Option? Plus, Puppies!